Since my daughter started pre-school we have had to deal with some new and challenging situations around her needing a gluten free diet. The most challenging one is around the birthday parties she is now getting invited to. We take snacks for her so she doesn’t have to worry about the risk of eating the wrong party food (let’s face it, party food isn’t usually wheat free!) but then there is the big moment – out comes the amazing birthday cake! The singing happens, the candles are blown out and everyone gets a nice big slice to eat there and then, as well as a piece in their party bag when they head home. And that is where we have the problem. I hate her being left out. Last week, we had our first order. A cake for my daughters best friend. 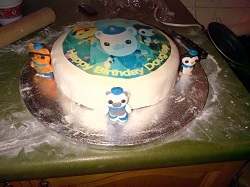 He loves the Octonauts and his mum had bought a template for the top of his cake so I just had to make the cake and ice it. To be honest I was a little disappointed. I wanted to make a full Octonauts underwater ship thingy! So I got some fondant icing and got my creativity out making the little characters instead! The cake worked out well and I even used food colouring to make it into a rainbow cake. It was very well received. In fact there were nearly blows as the kids tried to grab the Octonauts characters to scoff for themselves. They ended up safely out of harms way on a windowsill in the end! For me, I was just happy to see my daughter sitting round the table eating cake with all the other kids. The mothers are really good too. They have all started catering with gluten free food so she doesn’t feel left out at all. I am just about 39 years old, married with a daughter who was 3 in July, 2011. I live in Dundee We discovered my daughter was wheat intolerant when she was 2 using a process of elimination. When she was 2.5 we got her registered with a dietician who did a symptom based diagnosis of Coeliac. They suggested we keep all Gluten out of her diet and reintroduce gradually when she’s older. So far we have only seen a reaction to Wheat and not all Gluten and it is showing no signs of disappearing unfortunately. She used to get mild Eczema when she ate chocolate or too much dairy but she seems to have mostly grown out of that now. Sounds and looks like you’ve missed your vocation!!! Cake looks yummy!